Hello I own an Impreza. I'm addicted to making it faster. I can't stop. I got the car November 7th, 2000, (election day). 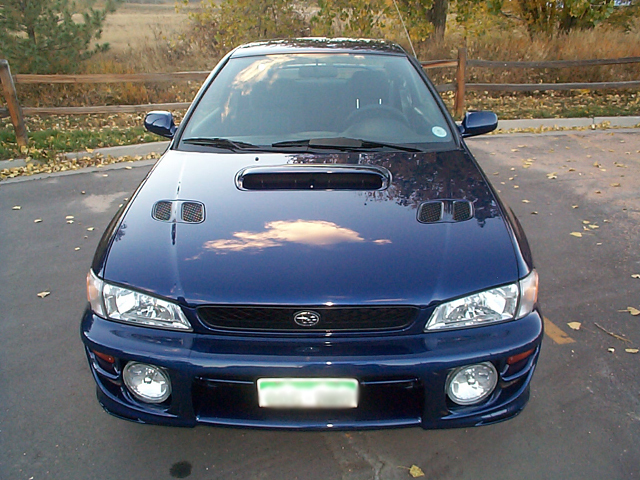 Checkers as I call her, is a blue ridge pearl, 2001 Impreza 2.5RS. I named her Checkers because of the carbon fiber I have all over her. So far checkers has only 30,000/miles on her. We hope to pass the N/A stage and move up to a turbo or NOS. So far I've got some Borla GEN III headers, mid-pipe and exhaust. Along with an intake, plugs, Magnacore wires and an upgraded ECU. We both accept each other for who we are and what we can offer to the other and right now, she's offering me 200 Horseys and over 200LB O big T. Daddy like. We're going places. 5/23/09 We have some new updates, after almost eight years I've reached what I'm calling stage II N/A.I threw a rod a few months back and did a total rebuild. Plus sized pistons, Delta Stage II Cams (spicy2000), Exedy lightweight flywheel, Exedy Stage II clutch. I also finally swapped out my Ganzflow intake for a new CAI that scoops from the right fender. Currently the car will not idle without ECU idle speed modifications. I plan on getting an I-speed reflash very soon to truly unlock the power of these new mods. The power gain so far has been fantastic but I have yet to get her on an AWD dyno to see any true numbers. More updates, numbers and photos soon. Nothing to look at here, Do not read this.